Hanging out in the yogurt aisle can make you very cold. Fortunately, I have readers who want to share their yogurt purchasing experiences. I was excited to find Stonyfield fat free yogurt on sale today at Whole Foods. However, when I got it home I noticed that they now have Stevia in the ingredients to bring the fat free down to 100 calories. They still use organic sugar. The low fat does not feature Stevia. I'm not happy about this at all (I'm a huge Stonyfield fan and the fat free has great flavor choices). Is there any way you can do a post about this? Thank you! Well, Leah, I went to Whole Foods and purchased the above yogurt for a mere 75 cents and there is stevia in it! The stevia is organic so that makes it okay, right? Clearly, stevia grown with pesticides and fertilizers is not a good addition. The addition of stevia to this yogurt makes me a bit sad because Stonyfield is a company that makes an ORGANIC product accessible to millions. Walmart carries Stonyfield yogurt and the movement away from pesticides, hormones, and petroleum based fertilizers is such a good thing for the environment and our health. Is Stevia/Truvia/PureVia A Safe Sweetener? Group Danone, a French company with 100,000 employees, owns Stonyfield. Did I think that being part of a global conglomerate was going to change Stonyfield? Why, yes, I did. What is my problem with stevia in the yogurt? I just don't think it is necessary - there are already 17 grams of sugar (over 3 teaspoons) for 6 ounces of yogurt. That seems like plenty. It leaves a slight chemical aftertaste in the yogurt. While the FDA has decided it is safe, I prefer to stick with the sweeteners that I know are safe - honey, sugar, maple syrup, etc. 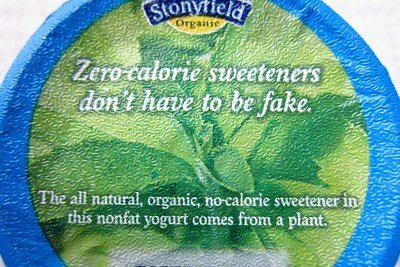 Stevia extracts are 200-300 times sweeter than sugar - I don't want a super sweet yogurt. I want it to taste like yogurt and strawberries! Stevia has been used for hundreds of years as a sweetener - but, if we add it to everything, we are going to be eating a larger concentration of it. Could there be a health problem that is created by stevia? I don't know, but I am not interested in doing the experiment on myself or my children. I have seen it being added to bread, juices, and now - yogurt. Why can't we just have lower calorie food that has less sugar added and tastes less sweet? My suggestion is to buy plain yogurt and mix your own flavors in it. This way you can control the amount of sugar - and you know what is in it. What do you think of the addition of stevia to Stonyfield's yogurt? I don't really understand why there is so much sugar in yogurt anyway. I started buying the plain stuff and adding fruit jams. Still has sugar, but I control how much. The store bought yogurts just seem so excessive in their sugar content. I also only buy plain yogurt, mostly for my green smoothies. However, recently, I haven't been able to find the plain Stonyfield Oikos Greek Yogurt anywhere - it has all been replaced by the Dannon Oikos Greek Yogurt (not organic). Now, I just don't buy yogurt. Disappointing. I'm a big supporter of Stonyfield, and I really love their whole milk plain yogurt. I've never used Stevia, and I'm still not sure what to think on it as far as its health concerns, but I agree with others that there really needs to be no sweeteners whatsoever in yogurt because fruit is naturally sweet! I'm still cautious about sweeteners, even stevia. I'd rather just moderate my real sugar use instead of putting the chemicals in my body. I find it said that companies add so much sugar/salt in products for "taste". I never buy flavored yogurt anymore. I buy plain and add honey, cinnamon, or fruit. Thanks so much for reinforcing our concerns, as consumers, about artificial sweeteners. I want to encourage you all to participate in a live, FREE webinar led by the International Life Sciences Institute (ILSI) North America and hosted by the eXtension Families Food and Fitness Community of Practice. This webinar will unveil the scientific research ILSI scientists discovered concerning artificial sweeteners and weight. With no product sponsorship or backing, this webinar is an unbiased, science-based learning opportunity about the research of low-calorie sweeteners and weight. Join us Wednesday, October 12 from 11-12 AM Eastern Time. Visit http://www.extension.org/60708/ for more information and the link to connect. Thank you so much for the story on this subject! I'm thrilled that you wrote about this (and included my feedback above). Keep up the great work! Why are you looking for fat free or low fat products? Please don't help to perpetuate the myth that fats make you fat. UNHEALTHY fats are bad, for sure, but there are plenty of wonderfully healthy fats such as (coconut oil, olive oil, avocado, nuts, seeds,etc. )that are VITAL to the body. In general, processed sugar-laden yogurts are a poor source of nutrients anyway, as you know. Have you ever spread a spoonful of almond butter on a pear or apple? Sheer delight! I, too, like the plain yogurt (Greek or Reg, Fat Free or 2% or full fat - it's all goood!) in large tubs and sweeten/flavor it for myself. My kids are not sold on that, but i'm working on them. 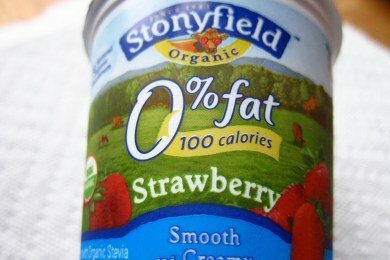 So, this Stonyfield new option is a great one I can pick up for them and not have to stress about too much sugar and/or artificial sweeteners. ;) I am a big fan of stevia, too. I use less than they do, I'm sure. Most all flavored/sweetened yogurts i try are too sweet. Sometimes if I'm in a pinch I'll buy one sweetened and one plain and mix them together and that makes it just about right for me. As a side note, Aldi just added Greek Yogurt to their regular product line, so for 85¢ i can stock up on greek yougurt for a decent price. Woo hoo! I don't like any of the fake sugars. I think I'm allergic to some of them. I get headches, nautious & dizzy. I try to avoid them & read the ingredients for a product before I buy them, but sometimes I miss it. They're in so many products these days. Stevia can be grown organically and since Stonyfield's yogurt is certified organic, they are not able to use non-organic stevia. As a Master Gardener, I have grown it and found it easy to grow. It really is a matter of taste when it comes to its use. Personally, I do not care for the taste of stevia as it has an aftertaste. It reminds me too much of aspartame. Your suggestion is actually the most sound. Added sugar is supposed to counteract the beneficial bacteria in yogurt. If you are going to eat it, simply add your own organic fruit. That is always the best way to go. Thanks for the post, Lisa. I love your articles. You always find interesting things to write about. Stevia is bound to be better than other virtually 0 cal sweeteners like saccharin. But you are right, that it's better to buy plain and add your own flavours. It's really useful to retrain yourself as to what you find sweet. Most shop bought and especially low fat options are way too sweet for me. I've never really liked the taste of Stevia, either. And I don't understand why sugar has to be added to EVERYTHING. I do the same as several people have posted; get the plain organic Greek yoghurt and add my own flavorings. I stopped buying Progresso soup when I tasted sugar in their Pot Roast soup. Sugar in POT ROAST????? Please!! Stevia is banned in Europe and Canada. Being natural does not mean it is healthy even if it is organic. It may not be any worse than the other sweeteners but it certainly is no better. Just has a good marketing angle. STEVIA - Well I just need to say what I think about it. I agree w/ the issue of "overdoses" of sweeteners like stevia. We need to re educate our taste!!! less sweet will be better.... Try this (I did) don't eat any sweets for 1-2 wks... any... then eat a granola bar or your favourite sweet snack!! you will be shock!!! how come b4 was not that sweet & now is extremely sweet? My roots are from South America, lived in the north of Argentina and South of PAraguay for many years. I saw first hand how the aboriginal people use stevia leaves. 2 or 3 in a big pot of boiling water to make their "mate" (tea) sweet - specially for kids. Or just put 1 or 2 of the leaves w/ the mate (tea) hot or cold to have the sweetness & that's all!!!! YES we tend to overdo on things!!! Lindah - I agree 100%. We need to use LESS sweetener and eat simple foods. Oatmeal with fresh fruit is a great breakfast but we want bars and junk. We don't need added sweeteners and we don't need added fats or sodium. Start with the children -- give them fruits and veggies and whole grains and they will love them. I work at Stonyfield and wanted to chime in and address some of your concerns. We’re concerned about the amount of sugar we add to our yogurts, too. In fact, almost half of the sugar listed in the nutritional info is what’s found naturally in the milk and in the fruit – which is why you see different sugar amounts in different flavors. We’ve tried a variety of all-natural sweeteners over the years, including honey, fruit juice concentrate, agave nectar, and naturally milled sugar. After a lot of trial and error, we found that a combination of sugar and stevia worked best to reduce added sugar. We chose stevia because it's the first all natural, plant-based, zero calorie sweetener that can be organically certified and provides the sweetness we were looking for to make sure our yogurt is delicious. For years we’ve received letters and calls from our fans asking for reduced sugar and fewer calories in their favorite organic yogurt. What we’ve heard and learned is that people want organic but also care about the amount of calories they consume, so we set out to provide a lighter yogurt option that didn’t use artificial sweeteners like aspartame and sucralose. For many people reducing the calories they eat can be an important part of staying healthy, and that used to mean having to choose artificial sweeteners that can have adverse affects on health in the long run. We believe organic yogurt lovers should have just as many choices as are available in non-organic products so we were excited to make reduced calorie organic yogurt a reality. At Stonyfield we’re committed to healthy foods, healthy people and a healthy planet, so you can be sure that we would never use an ingredient that we haven't determined to be safe. In fact, the safety of stevia was confirmed by independent experts and the FDA prior to its being put on the market. To reach the Acceptable Daily Intake (ADI) for stevia through eating our yogurt, a 150-pound person would have to eat over 15 Stonyfield 0% Fat yogurts per day! I'm really sorry some of you aren't happy with our new yogurt but I love to see all of your suggestions about adding your own fruit to plain yogurt, something a lot of us do here at Stonyfield as well. I hope you’ll find other varieties of Stonyfield Organic yogurt that aren't sweetened with stevia to your liking, like our fruit on the bottom 0% fat yogurt, our lowfat yogurt and our delicious Stonyfield Organic Oikos Greek 0% fat yogurt. I hope this has helped answer some questions. Yogurt really isn't good for you anyways. The dairy is one of the worst kinda you can eat, even with the macrobiotics it doesn't help and the stevia is just another reason. I am biased as it has made me very ill but cottage cheese is the same way. It may SEEM easy and good for you but the reality is a different story.